The miracle required for the beatification of Venerable Servants of God and for the canonization of Blesseds has always been examined with the utmost rigor. Already in medieval times, consultation was sought from medical experts for whom, on 17 September 1743, a specific Roster was created by Benedict XIV. More recently, on 20 October 1948, Pius XII established in the Congregation of Sacred Rites a Commission of Doctors to which he added a special Medical Council on 15 December 1948. On 10 July 1959, John XXIII unified these two bodies to form a Medical Board and approved its Regulations. In the light of new demands and on the basis of the Apostolic Consultation Sacra Rituum Congregatio of 8 May 1969, a further revision of the provisions of the Regulations was undertaken and approved by Paul VI on 23 April 1976. The promulgation of John Paul II’s Apostolic Constitution Divinus perfectionis Magister on 25 January 1983 and the experience of recent years on the part of this Congregation have demonstrated the need to further update the Regulations of the Medical Board. To this end, revised provisions of the Regulations of the Medical Board of the Congregation for the Causes of Saints have been drafted. § 1. In the Congregation for the Causes of Saints is constituted a Roster of Medical Experts to examine healings, which are proposed as miracles, regarding the Beatification of the Venerable Servants of God, and the canonization of Blesseds. § 2. If necessary, the Congregation can use ad casum Medical Experts who are not in the Roster of Medical Experts. Should it be that the alleged miraculous case are not of healing (for example, narrow escape from death, multiplication of food, etc. ), the Congregation shall appoint competent Technical Experts. The Technical Board proceeds in a similar way to the Medical Board. § 1. They may be registered in the Roster, in accordance with article 1 § 1, Medical Experts of proven competence and moral probity. § 2. Inscription in the Roster of Medical Experts is made for a term of five years (ad quinquennium) with an appointment letter from the Prefect of the Congregation. The appointment may be renewed in the same manner. § 3. Before exercising his office, the Medical Expert makes an oath to fulfill well his duties and maintain secrecy (de munere bene adimplendo et secreto servando). § 1. The President of the Medical Board is appointed by the Prefect of the Congregation after consulting with the members of the Roster of Medical Experts. § 2. The President shall be appointed for a term of five years and can be re-appointed only once. § 3. The President chairs the Medical Board with voting rights and directs the discussion. In addition, he draws up written opinions at the request of the Congregation. § 4. The Secretary of the Medical Board, chosen from among the Experts registered in the Roster. He is appointed for a term of five years by the Prefect of the Congregation and may be renewed at each expiration. § 5. The Secretary of the Medical Board draws up the Minutes and the Report of the meeting of the Medical Board, in which he participates without the right to vote. § 6. If necessary, the superiors of the Congregation may appoint from time to time a Secretary ad casum for the meeting of the Medical Board. § 7. The functions of the Relator of miracles, provided by the Apostolic Constitution Divinus perfectionis Magister, art. II, n. 8, are carried out by the Undersecretary of the Congregation. The Doctors registered in the Roster, once appointed, have the following responsibilities: a) to draw up a medico-legal vote; b) to participate in the meetings of the Medical Board; c) to resolve doubts and clarify eventual objections of the technico-scientific kind which are found during the examination of the case. § 1. Doctors appointed to a case are forbidden from making any contact with the Petitioner and the Postulator of the Cause under investigation. § 2. For any clarification or request for documents, the appointed Doctors must contact the office of the Undersecretary of the Congregation. A Medical Expert who dealt in any way with the case [during the Diocesan Phase], cannot be appointed by the Congregation for additional assignments regarding the same case in the Roman Phase. § 1. The Secretary of the Congregation, on a proposal from the Undersecretary, chooses two ex officio Experts, normally among the Doctors registered in the Roster, who are specialists in the subject of this case. § 2. Each ex officio Expert, bound by the obligation of secrecy of office, draws up their own independent medico-legal vote about the proposed case. § 1. If at least one of the ex officio Experts votes in the affirmative, the case can be forwarded for the peer review of the Medical Board. § 2. If the votes of both ex officio Experts are negative, the Undersecretary shall notify the Postulator of the Cause as he may decide to seek the vote of a third ex officio Expert, who is appointed under Article 8 § 1. If he votes in the negative as well, the case cannot proceed further (ad ulteriora). § 1. For every case, the Medical Board is composed of seven members, including the Chairman and the ex officio Experts. These Medical Experts, chosen by the Secretary of the Congregation at the proposal of the Undersecretary, are convened by the latter, with about a month’s notice, for peer review of the proposed event. § 2. Each Expert is sent the Chronology of the Case, the Summarium, the medico-legal reports of the ex officio Experts and any other documentation produced by the Postulator. § 1. The [meeting of the] Medical Board is valid if at least six of seven Experts participated. § 2. The Secretary, the Undersecretary and the Promoter of Faith of the Congregation assist at the meeting of the Medical Board, without however the right to vote. § 3. 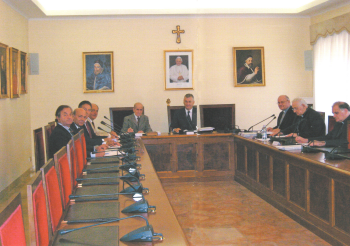 At the request of the Postulator, the Undersecretary shall propose to the Ordinary Congress of the Congregation the possible participation in the meeting of the Medical Board those Experts who are part of it who, however, did not attend the vote. At the beginning of the meeting of the Medical Board, the Experts are bound by oath to examine the case in accord with science and faith and to observe the secret of office regarding how the meeting was conducted, the judgment made by each member and the collegial conclusion of the Medical Board. following the group discussion, each Medical Expert expresses his final opinion. The Report on the examined case and its findings, signed by the President and Secretary of the meeting of the Medical Board, is presented to the Postulator and attached to the Acts of the cause. The case may proceed further (ad ulteriora) if the conclusions of the meeting of the Medical Board are affirmative with a qualified majority of at least five out of seven Experts, or four out of six Experts present at the same meeting. § 1. If the conclusion of the meeting of the Medical Board has a suspensive effect, the Postulator may provide the requested clarifications. § 2. The Undersecretary of the Congregation, after consultation with the President of the Medical Board, submits the request of the Postulator to the Ordinary Congress of the Congregation which decides whether or not to refer the case to the Medical Board. § 3. Should the Ordinary Congress decide to refer back the case to the Medical Board, the Board will be made up of the same Medical Experts in the preceding meeting. § 1. If the conclusion of the meeting of the Medical Board is negative, the Postulation can make new arguments regarding the case. § 2. The Undersecretary of the Congregation, after hearing the opinion of two new ex officio Medical Experts, submits the request of the Postulation to the Ordinary Congress of the Congregation, which decides whether or not to convene the Medical Board once again. § 3. This examination is done by another Medical Board, made up of new Medical Experts in accordance with article 10 § 1, which is chaired by a Doctor from the Register of Medical Experts appointed by the Prefect of the Congregation. A case that has been examined thrice by the Medical Board with a suspensive or negative conclusion can no longer be re-submitted. The Medical Experts, the Postulators and the Petitioner are bound to secrecy on all matters concerning the presumed miracle under review, especially if the one who obtained the miracle is a minor. § 1. The Congregation establishes the remuneration for the President, the Secretary of the Medical Board, the two ex officio Medical Experts and the other Medical Experts convoked for the same meeting. § 2. The remuneration shall be paid via bank transfer to the current account of the Expert, in accordance with the administrative rules in force. In accordance with article 1 § 2 of the General Regulation of the Roman Curia, dated 24 August 2016, His Eminence Pietro Cardinal Parolin, Secretary of State, through the mandate of the Supreme Pontiff, approved these Regulations for the Medical Board of the Congregation for the Causes of Saints, establishing that it begins to have force from that date and repealing any other previous norms.